The Alliance has long benefitted from the generous nature of our members. John Johnson, founding board member is proof of such an attitude. 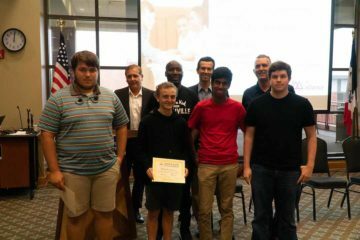 John has been organizing his own cybersecurity conference and kids hacker camp, in its fourth year now. CornCon 2018 was a great collection of security leaders and practitioners sharing their ideas and helping bring better understanding to the general public. St. Ambrose University provided an outstanding space for the event and delicious food for the participants. John spoke with the Alliance Team about brining the 2018 Converge Tour through the conference, with the goal of engaging local students. 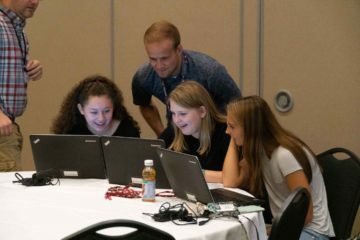 CornCon was able to bring together four local highschools and over 100 students for an impactful day of cyber education. Students were guided through exercises highlighting the nature of security in business, and how many of these same activities apply to their lives at home. John Johnson and fellow conference speakers Bob West of Deloitte, and Anthony Lauderdale of Motorola spoke directly with students about their career paths and the mentors along the way that have helped guild their most important decisions. The leaders agreed on a shared passion of continued learning and thoughtful curiosity. The team emphasized the power of networking and the importance of diversity of thought in problem solving. Students were divided into teams of 2-3, and guided through a gamified online education experience provided by our partners at Facebook. The Alliance would like to thank Shadrack Roberts and John Johnson, along with the rest of the organizers from CornCon. Special thanks are also extended to St. Ambrose University.